Kurdish maqam is slightly different than other types of maqam, in the sense that the term “maqam” doesn’t refer to classical Middle Eastern modes, and instead refers to specific themes or pieces. Horn and Shepherd’s Bloomsbury Encyclopedia poetically referred to the music as “monophonic hymns” – apt, once you begin listening to the emotional and embellished delivery in today’s example. The vocal style portrayed here, accompanied by oud though can also be accompanied by tanbur, is simply riveting, and it’s one that seems to have changed very little. 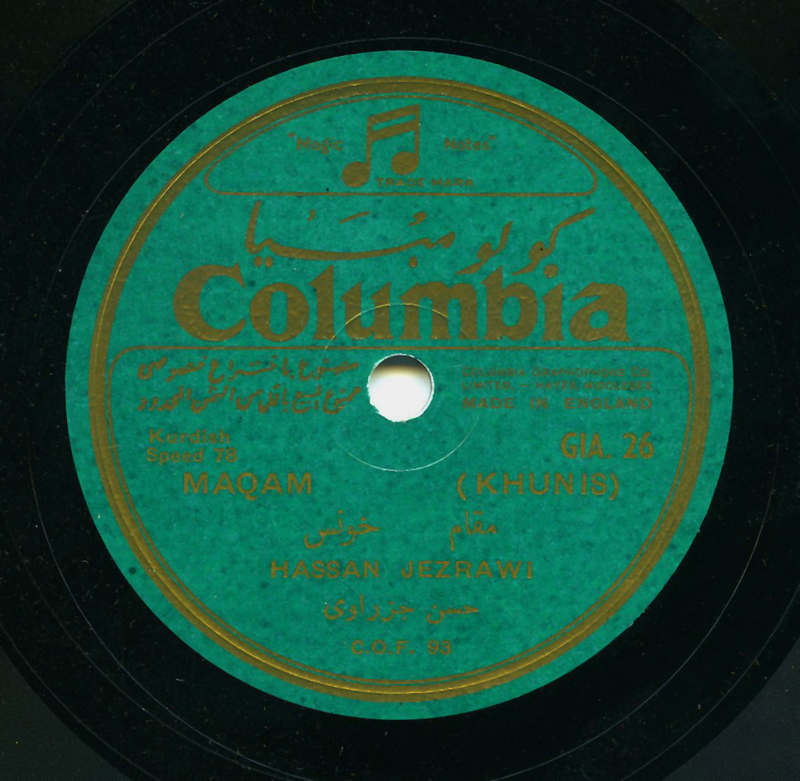 Iraqi-Kurdish classical singer Hesen Cizrawî (transliterated on this disc as “Hassan Jazrawi,” but also found spelled in innumerable variations), was born in 1917 and died in 1983. Judging alone by the frequency of his name mentioned in books, his later recordings on websites, bootleg cassettes, and on YouTube, as well as the related comments therein, Cizrawî is without a doubt one of the most important Kurdish artists of the 2nd half of the 20th century. There was another singer with the same surname, Mihemed Arif Cizrawî, who was unrelated, but an important and well-known singer that recorded as early as the 1930s. Hesen seems, in a way, to have a more resounding voice to my untrained ears. Not necessarily more artistic or subtle, but certainly a bracing voice that will jolt you upright. Here, he is accompanied by Dawud Al-Kuwaiti on violin, and Saleh Al-Kuwaiti on oud. Most texts don’t even address Kurdish recordings before 1970. Some, like the aforementioned encyclopedia, openly admit to having no clue. Well, we can put an end to that mystery here and now. The first documented recordings (so far) of Kurdish music were made in Turkey and issued by the Orfeon label sometime before 1920 – a grand total of 7 records. These would remain the only Kurdish recordings made in Turkey for decades, as there was a strict ban on the Kurdish language – just a sample of the difficulties Kurds experienced. Kurdish 78s made in Iraq or Iran, for example, would have to have been smuggled into Turkey for sale to Kurds through the black market. Thank you to Bill Dean-Myatt, Ahmad AlSalhi, Amir Mansour’s work, and collector friends. Beautiful. ” … no more on the margins than listening to or collecting Cajun recordings. ” Exactly. Wow. Thank you as always, but especially for this one wow. Wonderful music – many thanks again for posting! Great piece of my native music. One correction , Mihemed Arif Ciziri is equally if not more important classical kurdish meqam singer and is not Hesen Cizrawi’s father, they were close friends, not even related to each other. I am collecting and archieving both singer’s work. Great, Lauren – thank you so much! I amended the post. I will certainly contact you!